The current issue (Volume 4 Number 1) of the Journal of Contemporary Painting focuses on the relation between painting and time. The contributors, themselves mainly painters, explore a wide range of interesting questions about the ways they engage time in their diverse approaches to painting. Shortly before he died John Berger gave permission for the journal to re-publish his provocative 1979 article ‘Painting and time’ as the issue’s ‘Archival text’. I was invited by the painter Beth Harland, an Associate Editor for the Journal, to offer a response to Berger’s piece. 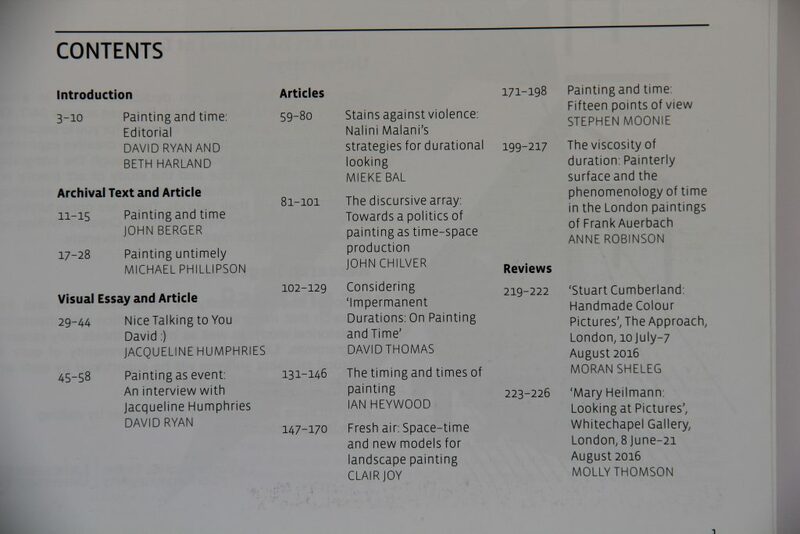 In the issue my text, ‘Painting untimely’, follows Berger’s re-printed article. The journal is published by ‘intellect books’ (www.intellectbooks.com).